· Code it: Drag and drop Graphical Programming software makeb Lock for airblock to Learn Programming & Aerodynamics, control the robot, and realize multiple Creative Case. · Fly or Sail it: airblock has two main modes: Hexacopter drone and Hovercraft, but with its modularity you can create even more modes. Safe to Fly or Sail. 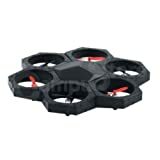 · Control it: easily use your iPhone/iPad or Android Smart Phone to Fly, Battle, Control and Program. · Crash & Rebuild it: It´s Fun to watch it hit Walls and crumble into Building Blocks. the Soft and durable Foam Material makes it Crash de friendly, but you don´t have to worry about damaging Walls or Furniture. · Airblock is the first modular drone that can be converted into a hovercraft, because, and more modes with your imagination. He does stunts by programming drag and drop. With magnetic fittings and modularity, it is easy to assemble and disassemble without the need for tools. Airblock is made of lightweight foam designed that is soft, durable and durable. Fans / blades are surrounded by hexagons, so they are not directly exposed to objects. Airblock is safe to fly around children and so children can fly safely. With Airblock, you can compete in a variety of games. Compete against others in different modes or even have an epic air battle. Programming is not only useful for future programmers and computer scientists, but also plays a vital role in the child´s learning phase. We hope to use more interesting and interactive programming gadgets to foster children´s love of science and technology. We hope that our devices can be attributed to the development of a child. System and Device Requirements iOS devices (including iPhone5, iPad mini, iPad 3 or later models) must be compatible with iOS 9.0 or higher. Android devices must be compatible with Android 4.1 or higher.